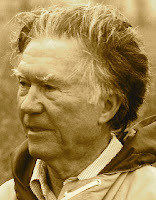 A Year of Being Here: William Stafford: "Little Rooms"
as lights needle forth below, through airy space. holding on, listening, hearing deep roots grow. with whatever happens, a glimpse of moon, a breeze. on the mane of the wind, like this, to give it to you. "Little Rooms" by William Stafford, from An Oregon Message. © Harper and Row, 1987. Photography credit: Detail from "Austin, texas [sic], a barefoot boy climbing a gigantic live oak tree," by Meredith Winn Photography (originally color, heavily edited by curator).